I absolutely love facilitating brainstorming sessions, as there is nothing that gets me more jazzed that coming up with game changing ideas. And those of you that know me, know that multi-colored sticky notes make my life complete. And brainstorming sessions are the perfect place for good mischief. What doesn't jazz me is this guy. 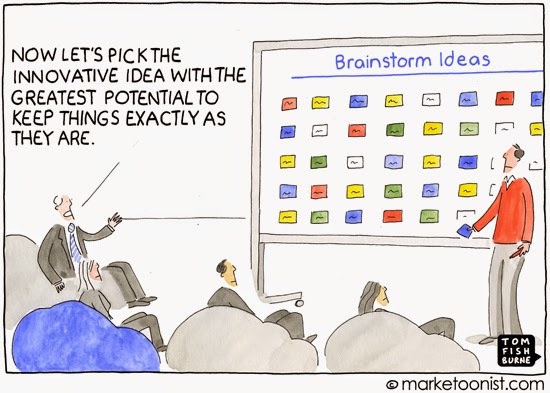 Tom Fishburne, the Marketoonist, calls him the Catch-22 guy. He is the guy who is sent in to ensure that at all costs, the status quo is preserved. Try bean bags in your brainstorming session if you must (great touch Tom), but do not -- I repeat -- Do NOT let this guy bring everyone else down. Facilitation is one part science and two parts magic. That's why consultants get paid the big bucks. Our job is to literally turn this guy around. He is bad mischief. I highly recommend that you listen to my interview with author Karen Hough, who wrote the Improvisational Edge to get some really practical tips on how to keep your team on track when this guy tries his bad mischief.